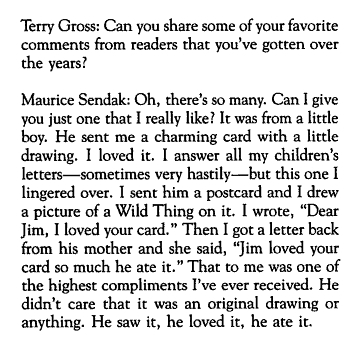 Terry Gross has done a very moving Fresh Air interview with Maurice Sendak, author of some of my favorite picture books, including Where the Wild Things Are and In The Night Kitchen. 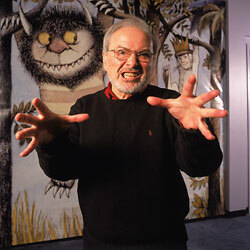 I’d always thought of Sendak as a grumpy old man (in the best way, because I have a soft spot for Grumpy Old Men–like Uncle Philbert), but Gross brought out a wholly new side of him. I found myself actually weeping as they talked. It’s a must listen. Check it out here.